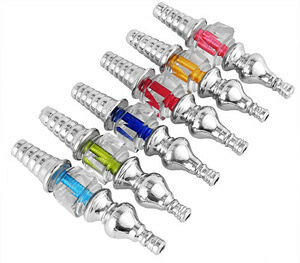 These replacement hose tips are six inches in length and have a decorative polymer center. They fit most three piece hoses, which are typically Egyptian. You can customize your hookah hose to create a color scheme that matches the motif of your hookah. They also works great as a premium private tip, which can be taken to hookah bars and social gatherings. Cubed Jewel Tips has a average rating of 0 stars out of 5 stars based on 0 reviews.